This Beautiful Romantic Country Lodge, has under floor heating, two bedrooms and a rainforest shower room. A haven for wildlife-peace and tranquility. This is Country living in style. Explore the picture book Kent towns or spend time on the local beaches. Picture yourself : picknicking with friends and a bottle of wine in a bluebell wood,or exploring a magical castle with the kids. You can do them all in Kent thanks to the unique blend of countryside, coast and breathtaking historic attractions, all perfect places to relax, refresh and unwind. Enter through the stable door into the open plan dining-kitchen area; to the left is the rustic bespoke hand made kitchen, which contains gas hob, electric fan oven & an electric conventional oven, microwave,coffee maker, fridge freezer, washing machine and dishwasher, cooking and dining utensils. Immediately in front of you is the dining area with an oak table and chairs seating 6 to 8. 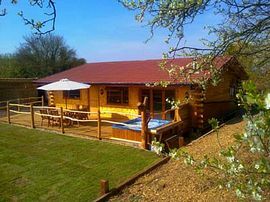 The accommodation provides a beautiful open plan spacious lounge with bi fold doors leading to the decked area and hot tub. There is a large corner suite with a 100 inch CINEMA TV SCREEN, and wood burning stove completing the scene. The Family room has a double bed with a set of three ft bunk beds. There are two bedside cabinets with bedside lights and two chest of drawers.There is also a large wardrobe . The Master bedroom has a king sized bed with bedside tables and lamps. There is a large dressing table with mirror, chest of rawers and a wardrobe. The view from the Master bedroom overlooks the wild life park. 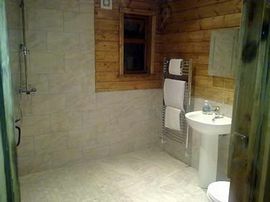 The wet room has under floor heating with a heated towel rail and an endless supply of hot water supplied by a combination boiler. There are two shower heads the Rainforest and an adjustable conventional head. The mirror over the sink has a shaver point and an electric toothbrush point. 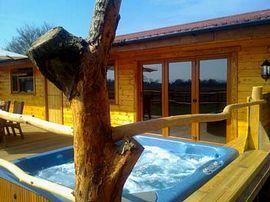 Luxuries: Jacuzzi-Hot tub, Log burner, Internet access, Cinema Screen TV,DVD player. Standard: Kettle, Toaster, Iron and ironing board, Hair dryer. Utilities: Cooker, Microwave, Fridge, Freezer, Washing machine,Dishwasher. 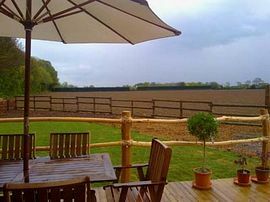 Quite simply No 1 for Luxury self catering holiday rentals in Kent. 100inch Cinema screen TV with Surround Sound. Wet room with rain forest shower. From the M2 take the A299 take the Whitstable exit follow the brown signs to the wildlife park and the cottage is the 3rd driveway past Druidstone on the same side of the road. Autumn 5 September 09 1 November 09 £845.00. November - Dec 1 November 09 20 December 09 £845.00. Xmas-New Year 20 December 09 4 January 10 £1,500.00. Winter 4 January 10 12 February 10 £845.00. Valentines 12 February 10 22 February 10 £945.00. Winter 22 February 10 2 April 10 £845.00. 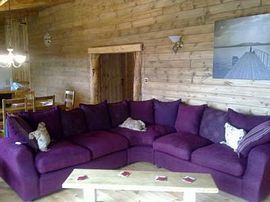 June Special Offer 7 June 10 25 June 10 £645.00. Midweek Breaks Arrive Monday 4.00pm. Depart Friday 10.00am. Long Weekend Breaks Arrive Friday 4.00pm. Depart Monday 10.00am. Short Weekend Breaks Arrive 4.00pm Friday-Saturday Depart Sunday-Monday 10.00am. To Book Online and to see our terms and conditions please visit our Website. Gold Award from English Tourist Board.